We haven’t seen Ajahn Santutthi at The Armadale Meditation Group for some time now so it was a welcome surprise. Ajahn began the evening by asking us to let go of the doer in our mind, so the mind can begin to relax. We constantly look for things to do in life and our mind isn’t much different. Our mind is constantly looking for things to make it happy, things to do. The doer in our mind doesn’t do relax. So to really relax, we need to let it go and just be in the present moment. Ajahn led us in a longer than usual meditation this evening that is well suited to beginners and experienced alike. After the meditation, rather than talk on any specific subject, Ajahn opened to a Q&A to conclude the evening. Interspersed throughout Q&A are some funny stories to further relax us all. Ajahn Santutthi conducts an intermeditate/ advanced meditation class for approximately one hour. Recorded at Dhammaloka Buddhist Centre, Perth, Western Australia. Ajahn Santutthi says that meditation is like marinating an olive. It takes time for the olives to become delicious. In the same way, it takes time and patience for our mind to settle down. The first beginners meditation for 2018 and our teacher is Ajahn Santutthi. For the benefit of first timers and those of us beginning in meditation, Ajahn Santutthi gave us an excellent layman’s explanation of meditation. Ajahn then guided us through a 30 minute meditation followed by Q&A. 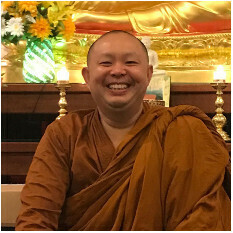 Ajahn Santutthi talked to us about finding the calm in the storm of our minds through meditation. Over thinking can lead to us becoming anxious, we need to live in the moment, not dwell on the past, nor worry about our future. When we over think, dwell in the past or worry about the future we don't live in the present. Our minds become tired and so do our bodies. Meditation can help us clear our mind, live just in this moment and recover some of our energies. After his talk, Ajahn led us in a guided meditation for approximately 45 minutes. Ajahn Santutthi teaches us how to prepare our mind for meditation practice and how to overcome mental negativity. Ajahn discusses how being content leads to a peaceful mind. Ajahn joined us again this week at The Armadale Meditation Group. He suggested that we spend much time in our busy daily lives collecting rubbish within our minds and meditation is the means to get rid of it, empty the garbage. Ajahn then guided us through a meditation with relaxation of our bodies first. The focus of our meditation was our breath or breathing. Ajahn then opened the floor to questions. Following Q&A Ajahn told us of his recent visit to Thailand were he met with Ajahn Gunhah, the original happy monk.